Posted on February 3, 2012 by M.E. Bottoms up. Drake celebrates the booty in the video for “Practice.” Inspired by Serena Williams’ viral clip, the visuals star a voluptuous vixen who dances in her bedroom mirror to his Juvenile-sampled song off Take Care. At the end, Drizzy surprises her and the cameras cut as they take it to the bed. The Young Money rapper, who launches his “Club Paradise” tour on Valentine’s Day, is asking his fans to submit videos of themselves dancing to the song. Posted on December 8, 2011 by M.E. For fall 2012, the traditional business suit has gone through a much-needed fashion makeover and been turned into a sleek, youthful and modern ensemble. Tailored clothing manufacturers are proposing a formfitting silhouette, with narrow lapels and tight, defined shoulders that will empower any executive. (1.) Gucci’s wool and cotton suit and Prada’s cotton shirt. Linda Farrow glasses; Alexander Olch tie; TheTieBar.com tie bar; Imperial pocket square; Gucci belt and shoes. (2.) Tallia Orange’s poly and rayon suit and Prada’s cotton shirt. Hugo Boss sunglasses; John Varvatos tie; Tateossian tie bar; Thomas Pink gloves; Louis Vuitton briefcase and shoes. (3L.) Elie Tahari’s wool suit and Kiton’s cotton shirt. Yves Saint Laurent sunglasses; Bespoken tie; Tateossian tie bar; Imperial pocket square; Dunhill gloves; Calvin Klein briefcase; Gucci shoes. (3R.) Joseph Abboud’s wool suit, Ermenegildo Zegna’s cotton shirt and Thomas Pink’s wool coat. Gucci sunglasses; Giorgio Armani tie and pocket square; Salvatore Ferragamo tie bar; Thomas Pink gloves; Calvin Klein portfolio; Louis Vuitton shoes. (4L.) Dior Homme’s wool suit and Burberry London’s cotton shirt. Alexander Olch tie; TheTieBar.com tie bar; Salvatore Ferragamo belt; Bally shoes. (4R.) Boss Selection’s wool suit and Kiton’s cotton shirt. Oliver Peoples glasses; John Varvatos tie; Tateossian tie bar; Imperial pocket square; Brioni gloves; Calvin Klein briefcase and shoes. (5.) Calvin Klein’s wool suit and Prada’s cotton shirt. Fendi sunglasses; Brioni tie; Tateossian tie bar; Bally Belt and shoes; CH Carolina Herrera gloves; Salvatore Ferragamo briefcase. This Christian Louboutin John John Men’s Flat Shoe from the Fall/Winter 2011 Collection retails at $865. I must say I really like the style and look of the shoe. They remind me of the classic style of the 20’s and 30’s where the lace-up style shoes were in high demand. They can definitely be rocked with a nice tailored suit or a pair of designer jeans. I’m diggin’ them!!! Something to have chillin’ in the shoe collection. They’re offered in multicolored variations: one in navy blue/gray and the other in burgundy/light blue. The Watch the Throne tour made its stop in Kanye West’s hometown of Chicago this week. 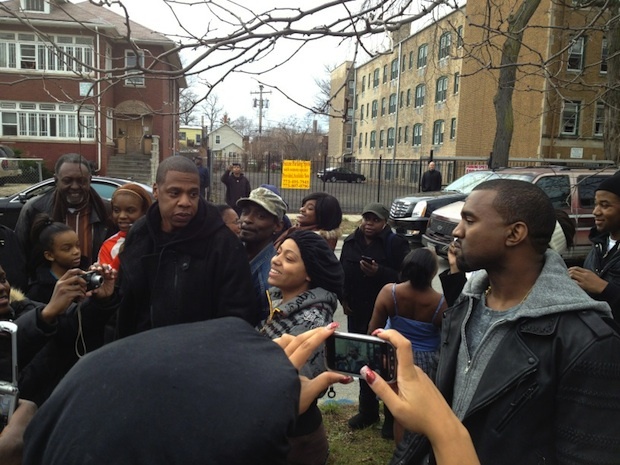 During his downtime, Kanye and Jay spent their time connecting with the fans by visiting random locations throughout the city. Jay-Z was spotted in a Givenchy leather and shearling biker jacket retailing at $4,070, while Kanye sported the 3.1 Phillip Lim braided black leather biker jacket priced at $1,750. It appears Kanye had his customized, as the jacket originally features silver hardware detailing, his is all black out.